Many purchasers commented that the Adidas Raleigh 9tis Mid is a great looking and stylish shoe. It can easily be availed at an affordable price. Many also said that the quality of this shoe is great. One reviewer noted that he gets lots of compliments with this shoe on. It comes with an extra pair of laces. Some of the reviewers appreciate the retro look of this shoe. One reviewer liked the ankle support that this shoe provides. There were several comments saying that the Adidas Raleigh 9tis Mid is an extremely narrow shoe, especially in the toe area. They recommend going a half to full size up for a more comfortable fit. A few reviewers were disappointed that the sole of this shoe wore out fast. Some users commented that this shoe does not have much cushion at all. One user emphasized that this shoe has poor breathability. With its chunkiness inspired by two classic basketball shoes from the '80s, the Adidas Raleigh 9tis Mid will probably be appreciated by those who like a bit of a throwback style in their getups. Not only is it affordable, it also is great looking especially when worn as a casual shoe. However, several users reported that this is an extremely narrow shoe so it is advisable to get this half or full size up for a more comfortable fit. The Adidas NEO is a fast fashion sub-brand under Adidas that targets the younger generation or the youth as their main audience market. Its products range from casual footwear to apparel that can be easily accessed through social tools and at affordable prices. To better convey to its target audience market, it signed teen icons Justin Bieber and Selena Gomez as its brand ambassadors. One of the best-selling shoes in the Adidas NEO sub-brand is the Adidas Raleigh, which was first released in 2013. Exuding a classic vibe, it has the classic Adidas DNA as it was based on the Centennial and the Decade with added inspiration drawn from the Rivalry and the Conductor. Both the Centennial and the Decade were popular Adidas basketball shoes in the ‘80s, with versions released in high top silhouettes in a leather-based upper with a prominent tongue. Such features were also apparent in the Raleigh. The Adidas Raleigh Mid is a mid-cut shoe that features a soft leather upper, lace closure, rubber outsole, prominent tongue, and the Adidas three stripes down the sides. It has become one of the highly sought models in the NEO sub-brands mainly for its style and affordability. It is also released in another variation – the Adidas Raleigh 9tis Mid. Similarly, the Raleigh 9tis Mid is a mid-cut shoe following the original silhouette of the Raleigh. The tongue is still prominent in this version, but the upper is a mix of leather and suede material. There is also a pull tab on the heel, which was lacking in the original Raleigh model. Another difference is the Adidas branding on the heel counter. The Raleigh Mid has a small Adidas name branding, while the Raleigh 9tis Mid’s branding is huge and striking. A mid-cut chunky basketball-inspired shoe, the Adidas Raleigh 9tis Mid features a soft leather and suede upper and a vulcanized rubber sole. It basically looks great with almost anything, but it looks best when worn with jeans. It also comes with an extra set of laces in a different color for a more flexible styling. 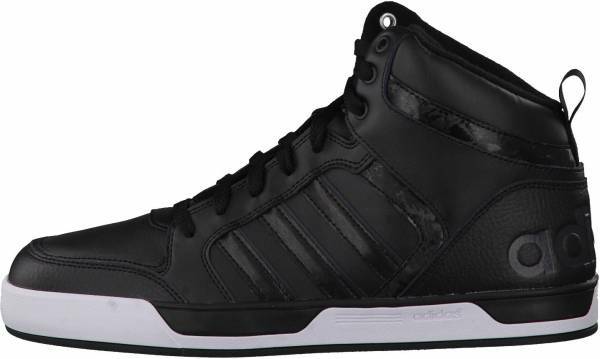 The Adidas Raleigh 9tis Mid is available in men’s sizes from size 6. 5 to 14 in D Medium width. It is also available for little kids and big kids’ sizes. Its mid-cut construction provides much-needed ankle support while the lace closure offers an adjustable fit. The pull tab on the heel makes it easier to put on. Like the Adidas Raleigh Mid shoe, this 9tis version features the signature three stripes down the sides. Its huge tongue is prominent as well, which adds a nice touch to its overall style. But what sets it apart from the original version is that it has a pull tab on the heel and its upper materials are made of soft leather and suede. It also has a striking, big Adidas brand name printed along the heel counter. The Adidas Raleigh 9tis Mid also features a color blocked vulcanized sole. It has a textile lining and the collar is well-padded for added comfort. The tongue also bears the Adidas logo.